WILD LOVE BAKEHOUSE: Be sure to make time to detour to this little bakery in Knoxville. It is so good, we visited twice - loading up on coffee cake and prosciutto-filled croissants on the way down and cookies & some cinnamon bun deliciousness on the way back. DANCING BEAR LODGE. Book one of these awesome cabins close to the Townsend entrance of the park. On-property bistro has a fire pit & complementary s’mores every night. Note to self: Get hot tub cabin next time. 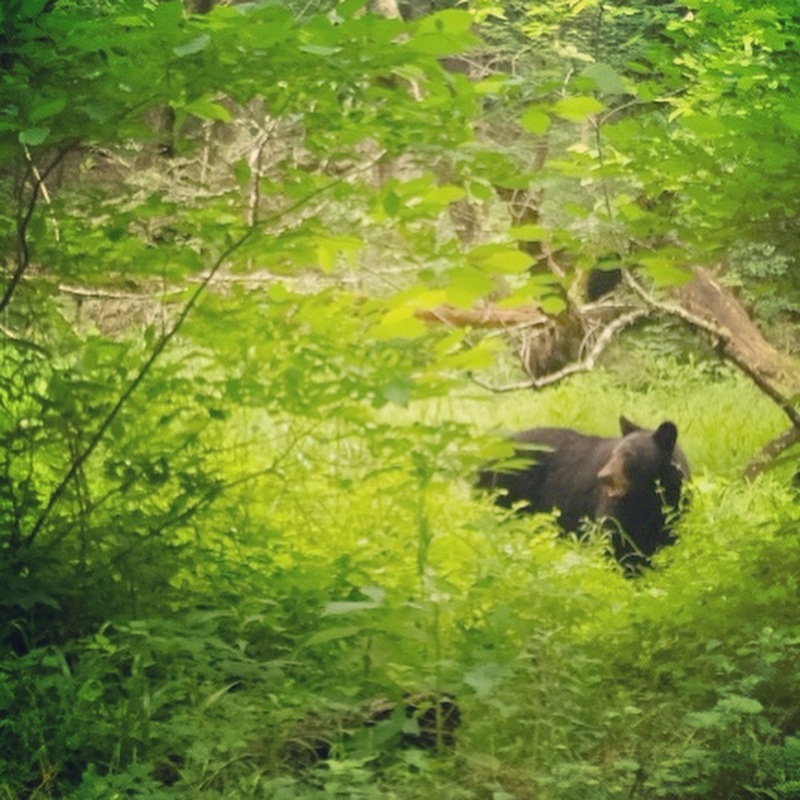 PARK PLANNING: Check out the NPS site and Hiking in the Smokies for trail info & more. LAUREL FALLS: This easy up & back 3 miler stretched our legs after the six-hour drive from Columbus. Being a nerd for flora & fungi, I was pumped to see the mountain laurel, columbine & a crap-ton of mushrooms along the way. Just before you get to the falls on the main trail, there’s a way to drop down and see the 80 ft. falls from the bottom. Definitely worth checking out. ALUM CAVE & BLUFFS: We got up at the crack of dawn to get to the Alum Cave trailhead. The plan was to do the “moderate” 6 mile hike, then check out another smaller trail near by. The Alum Cave runs by a rushing river for the first couple of miles, full of wooden bridges & photo ops. There’s a cool spiral trail staircase, then a climb to a plateau. Someone told us that the bluffs were still ahead so we pressed on, and on, and on. Finally we asked another person about the bluffs & they laughed – we passed them a long time ago & we were on the trail to Mount Le Conte. 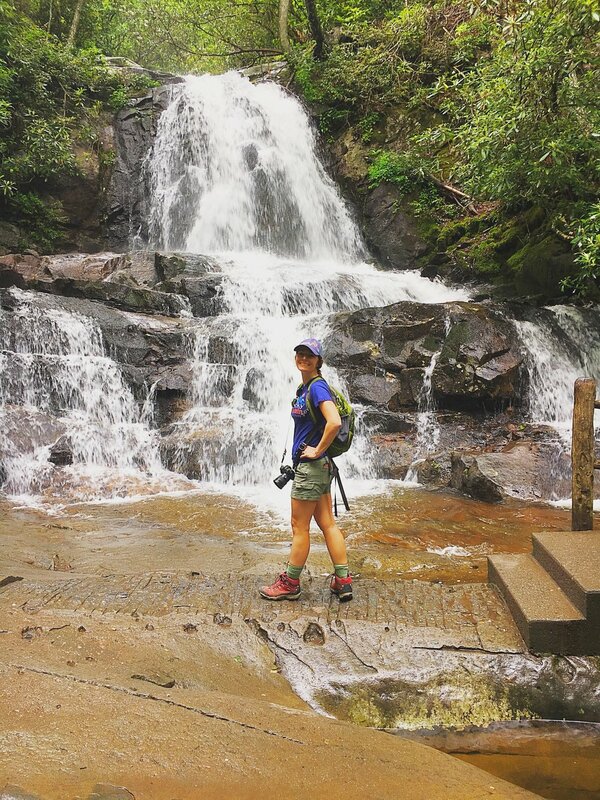 (The trail review Mt LeConte said it was a “strenuous” 11 miler – yikes!) My legs were burning & our rain jackets were protecting us from a storm coming through so I was about ready to turn around. Then the woman said, “You’ve already done the steepest part. Plus there’s a place at the top to get hot chocolate and souvenirs.” Yep – that’s all we needed to press on. MOUNT LE CONTE (aka ALUM CAVE continued! ): The sun started to come out as we wandered around ledges, giving us mountain views made even more stunning by the rhododendron starting to bloom. When we reached the top of Mount Le Conte, we found a little cabin village complete with that dining room & hot chocolate our trail angel told us about. We grabbed 2 rocking chairs on the porch, fended off some wild & hungry squirrels and chowed down on some freshly made cookies from the dining room. We certainly didn’t expect to do this full hike – but I’m so glad that we did. HIGHLY RECOMMEND! CADES COVE: For our last day, I thought we’d do the drive through the 11 mile loop of Cades Cove. It would give our legs a chance to recover and is known for wildlife spotting early in the morning. What I forgot was they close the loop to drivers twice a week, so the road is clear for bikers & pedestrians. So we parked our car & decided to head out on foot. Immediately we heard wild turkeys gobbling up a storm in the woods. So freakin’ noisy but they kept tucked away. I was optimistic that we’d see some down the road, since our wildlife spotting had been limited to a snake & those psycho squirrels the day before. We took the first turn in the trail to shrink our loop to three miles and made our way through a valley fenced off for horses. Spider webs covered the fences & lined the trees – all very pretty, dotted with rain from the night before. As we made our way into a tree-lined area, we encountered a family of deer who were just as interested in watching us as we were them. I know we have deer in Ohio, but the intimacy of our brief encounter with this family made me feel like I won the wildlife lottery. So you can imagine how pumped I was when we saw some bikers stop in front of us, since there were FOUR BEARS rummaging around in the woods near by. We all kept our distance but were pretty mesmerized by the mama & cubs we saw. It was the quintessential Smokies and a final reminder why you should always say yes to adventure. 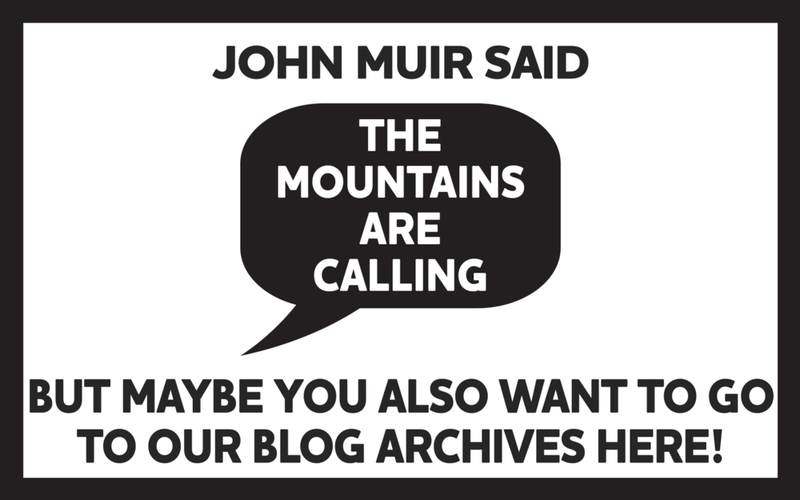 When Rita submitted this blog to us she also included what she called her "doodles." See below for this magnificent art she created while "doodling" this blog out on a plane ride from San Diego to Columbus. It's pretty amazing and a great reminder to NEVER EVER cap your creativity or imagination of art in your life. Keep making art everyone. What do you think about both these doodles and Rita's adventures? 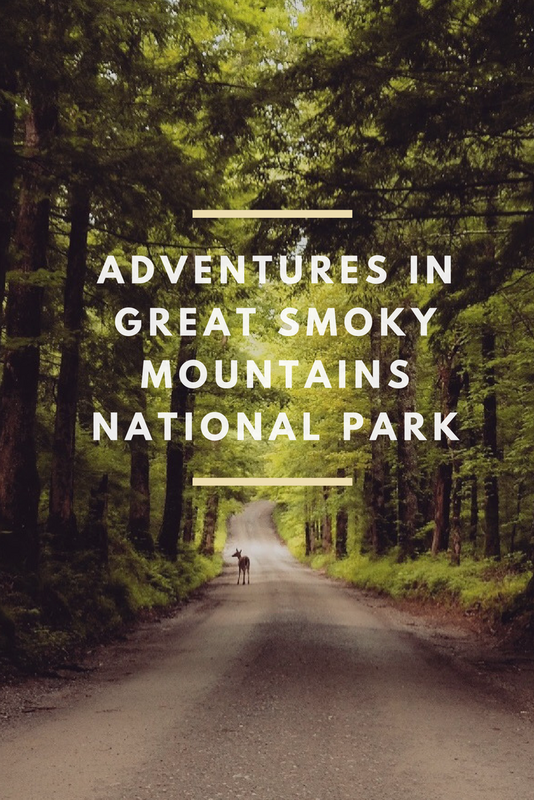 Put your comments below and we can help ya get ready for some adventures in the Great Smoky Mountains NP! Also make sure you connect with Rita HERE and follow along on more of her adventures. Check out our FB events page for some great upcoming events and adventures that you can join us and others from around the country on!